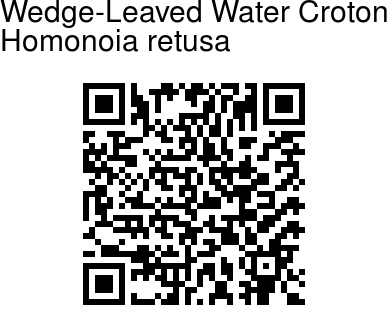 Wedge-Leaved Water Croton is a shrub growing near rocky areas and stream beds. Leaves are alternate, oblong to spathulate, 2-4 x 1-2 cm, margin toothed, tip blunt to flat. Lateral nerves are about 4 pairs. Leaf-stalks are up to 3 mm. Flower spikes are up to 1 cm long. Male 4 mm across: tepals 3, becoming hairless, 2.5 mm; anthers 0.2 mm. Female flowers 3 mm across: tepals 6-8, linear, 2 mm, acute; ovary 3-lobed; styles 3 mm, recurved, Capsule is about 3.5 mm across. 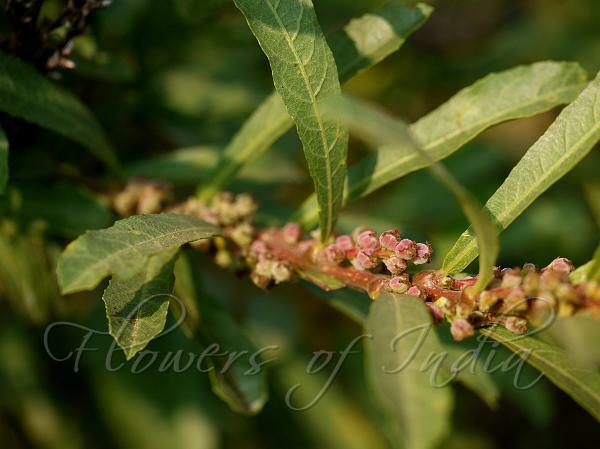 Wedge-Leaved Water Croton is found in Western Ghats, and is endemic to peninsular India. Flowering: January-August. Photographed on riverbed along Kumta Siddapur-Road, Karnataka.